Spring is Coming! | The Happy Wonderer ~ ellen b. Spring here in Colville starts out as the season of mud from all the snow melting. Hopefully rain showers won’t compound the season of mud. This is an exciting week with the start of Spring coinciding with our granddaughter’s 2nd birthday. Our little BBB (Baby Boy Bayles) is growing as he should and mommy is healthy. We never take this for granted and we are thankful. 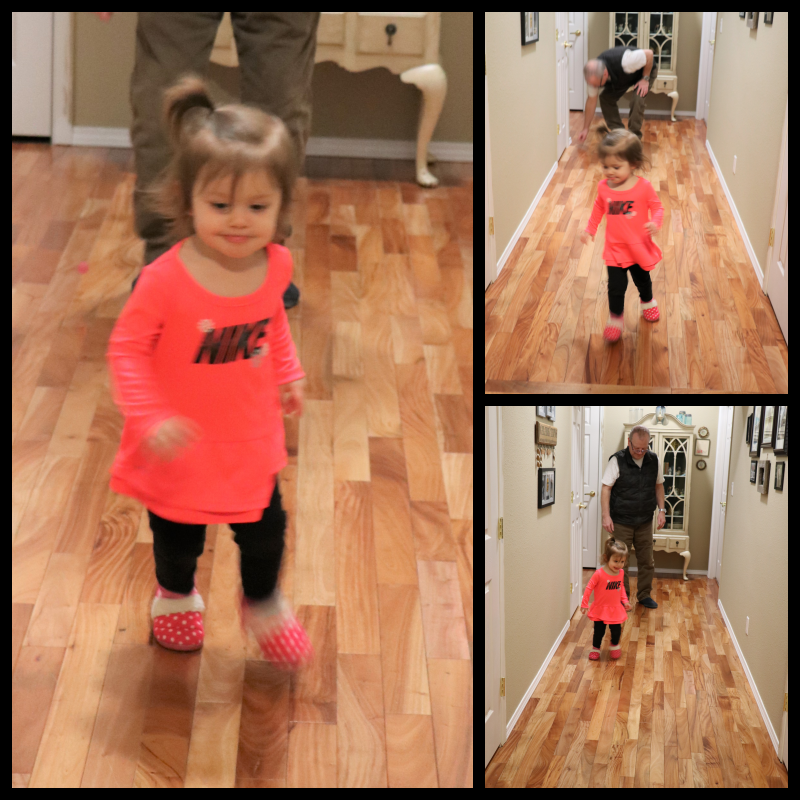 We have a new fun game at our house that Dear and Addy enjoyed while we watched her one evening last week. It’s a mini kind of handball using small bouncy balls in the hall. It caused such joy and belly laughs! On Saturday evening we enjoyed a meal with Addy and her parents of Corned Beef and Cabbage with Lemon Meringue Pie for dessert. 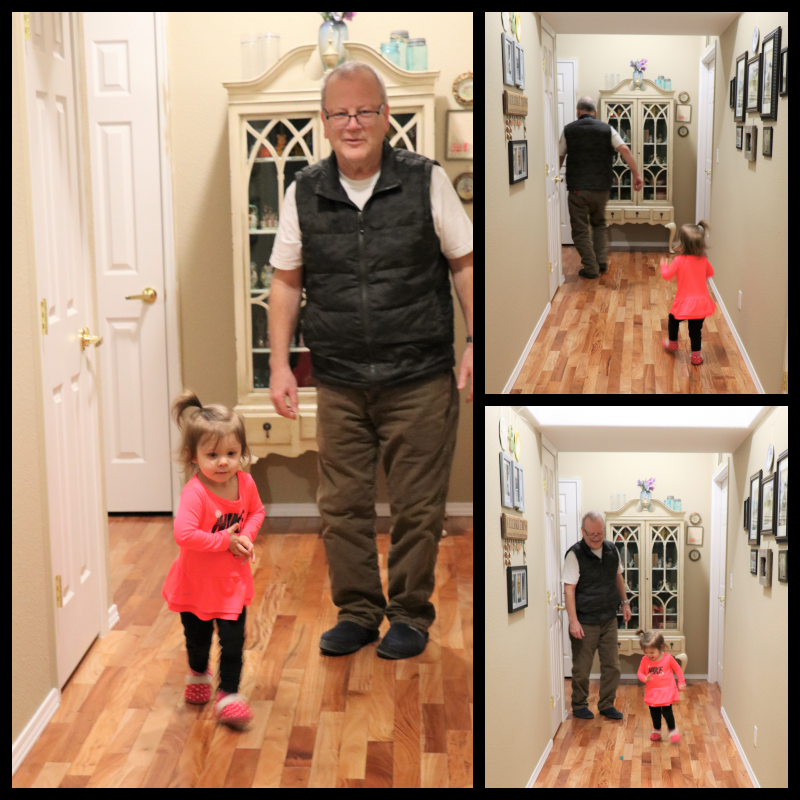 More handball in the hall and the traditional things Addy enjoys when she visits Baba and Gramps were on the agenda, too. We are taking in and enjoying these days with young grandchildren. We are looking forward to this week and next weekend in particular as all our kids will be here for 2 birthday celebrations and a baby shower for our soon to arrive grandson. Trips to the airport and nonstop fun are on the schedule. I’ll have to get my visiting to your blogs early in the week before all my attention is taken up with the face to face interactions I’ve been missing with our “Coast Kids”. Joining Angie at Letting Go of the Bay Leaf for Mosaic Monday. 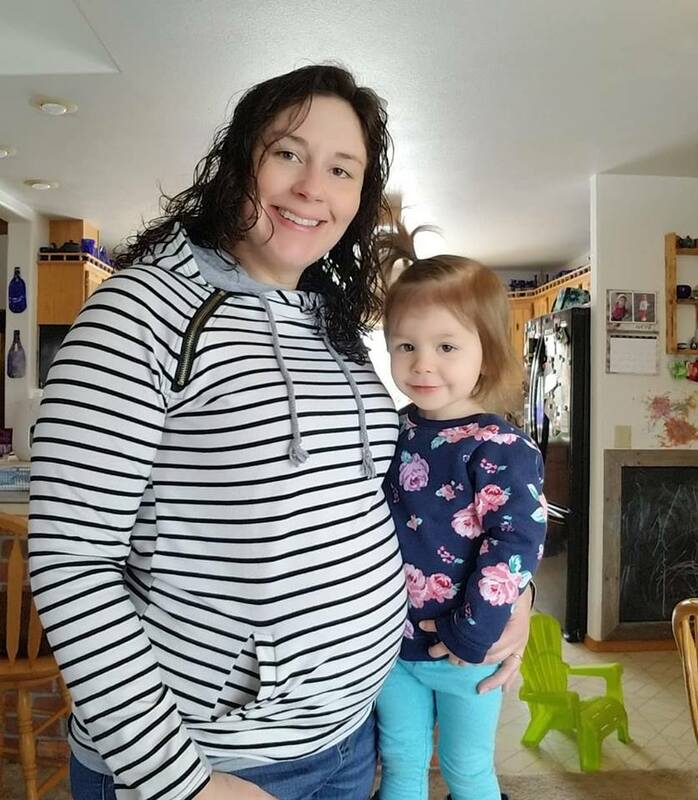 Posted on March 17, 2019 by Ellen •	This entry was posted in Addyson May, Grandchildren, Mosaic Monday and tagged Addy 23 -3/4 Months Old, Addy and Gramps, Spring. Bookmark the permalink. …now exactly when is spring coming? 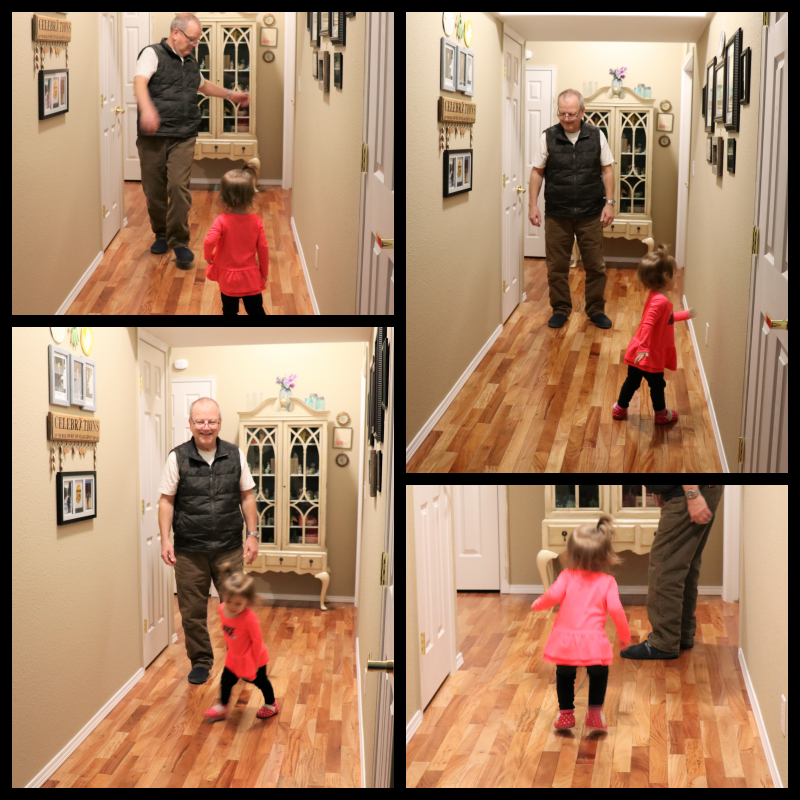 Addy will have so many memories of times with grandpa as she grows up. Happy birthday to Addy! She is adorable. 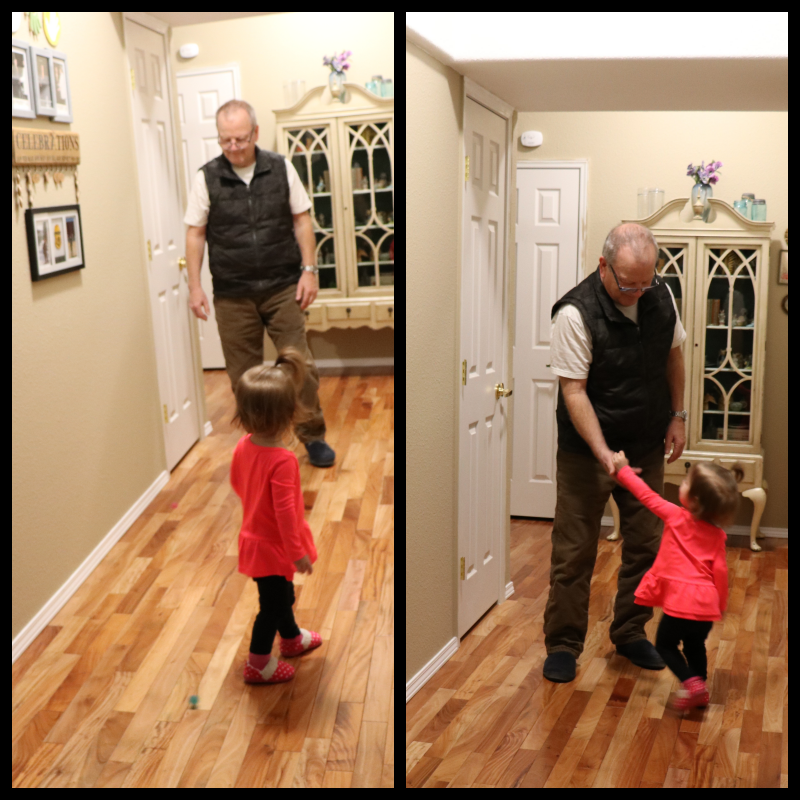 Fun photos of Addy playing with her Grandpa. Enjoy your day, have a happy week ahead. Happy Birthday to Addy, too… she is so sweet. Ellen – I can relate to mud season. Driving the three miles to our house these last few days has been difficult … most people wouldn’t believe it can be harder to drive in mud than on hard-packed snow! Anyway, it’s temporary and the sunshine streaming through my windows right now makes up for it. I am grinning at the pictures of Dear and Addy – I can just imagine the fun and laughter! Thanks for taking the time to link up to Mosaic Monday, and enjoy all the family festivities! I just love those belly laughs! I remember especially those of our first grandgirl at about the same age. It brings such joy to see them so easily entertained. The one that’s two now has the best giggle. 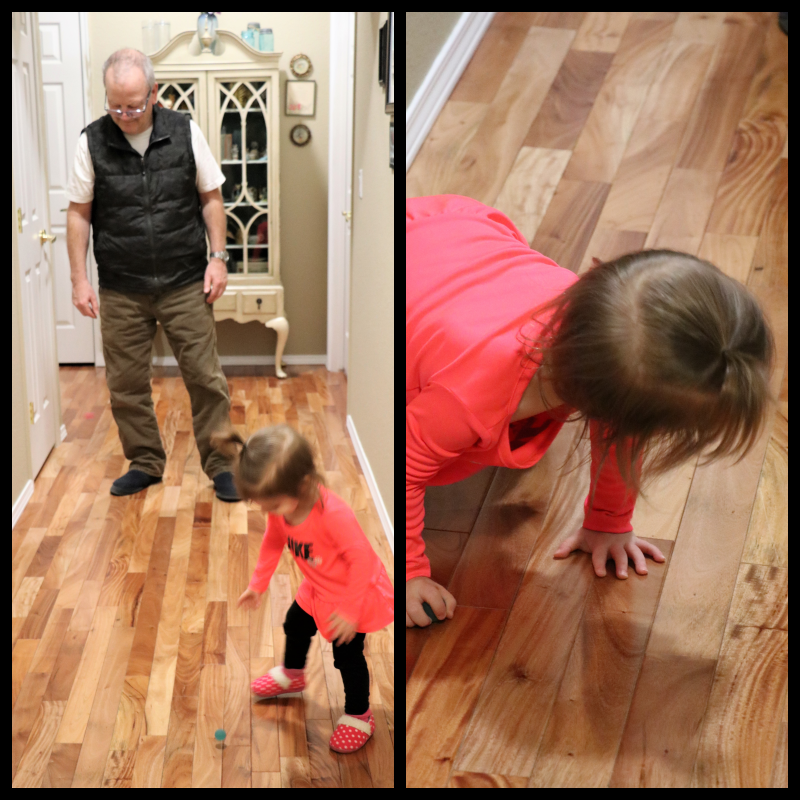 You have the perfect space for playing bouncy ball with that lovely wooden flooring. Happy birthday to Addy! A lovely photo of Addy and Mummy. Have a lovely week and weekend with your company and enjoy those special celebrations. What a joy it must be to have Addy around the house. Sure hard to believe she will be 2!!! Happy to hear her soon to be bother and mom are doing fine!! Belly laughs from a little one are just the best! Precious! Have a wonderful time celebrating with your family this weekend! Happy 2nd birthday to Addy!! (That was fast!) You’ll be having a baby shower this weekend and we’re having a bridal shower! We are blessed! !